The right to privacy is a crucial element of our personal security, for free speech and for democratic participation. It is a fundamental right in the primary law of the European Union and is recognised in numerous international legal instruments. Digital technologies have generated a new environment of potential benefits and threats to this fundamental right. As a result, defending our right to privacy is at the centre of EDRi’s priorities. The Counter-Terrorism and Border Security Act 2019 became law in the United Kingdom (UK) in February, after passing through UK parliament with less debate than many had hoped, while Brexit dominated the political agenda. The new law is problematic in many ways, including the way in which it limits freedom of expression and access to information online. It also creates extensive new border security powers, which include accessing information on electronic devices. The draft law was widely criticised by civil society organisations, which led to some changes to the text. However, the changes were limited and did not do enough to safeguard freedom of expression and access to information. The new law criminalises publication of pictures of clothes, symbols, or for example of a flag in a way that raises “reasonable suspicion” – an expression that leads into a low legal threshold – that the person publishing the picture is a member or supporter of a terrorist organisation. “Publication” includes posting on social media pictures or video that have been taken privately at home. This could be, for example, a selfie with a poster in the background that shows the symbol of a terrorist organisation. A related problem is that the UK authorities have admitted that at least 14 organisations that are currently listed as terrorist organisations do not meet the criteria for being on the list. Another clause makes it a crime to watch or otherwise access information online that is likely to be useful to a person committing or preparing acts of terrorism. It also includes, for example, watching the content over the shoulder of another person who is sitting by a computer. After debates in parliament, the government agreed to make a change, which states that working as a journalist or carrying out academic research is an acceptable excuse for accessing material online that could be useful for terrorism. This was a positive change, but not nearly sufficient, and the clause is still very problematic. No terrorist intent is required, and if someone for example watches a terrorist video online because she or he wants to understand why people might be drawn to terrorism, the person risks a long prison sentence. The law also introduces wide new border security powers connected to a new and vaguely defined crime of “hostile activity”. Under the new powers, anyone can be stopped on the border, even if there are no suspicions that the person has been involved in hostile activity, and it’s a crime not to answer questions by the border officers or hand over to them requested information. A draft code of practice, which will guide how border officers use the powers, specifies that information “may include passwords to electronic devices”. During the first hour of questioning there is no right to a lawyer. How this deeply concerning piece of legislation will work in practice remains to be seen. We fear that vague and overbroad provisions lead to arbitrariness and discrimination affecting human rights defenders, journalists, or ethnic minority groups on the grounds of mere suspicion. On 12 February 2019, the European Union Agency for Fundamental Rights (FRA) published an Opinion regarding the Regulation on preventing the dissemination of terrorist content online. In the same day, the European Data Protection Supervisor (EDPS) submitted its comments on the topic to the responsible committee in the European Parliament. These two texts complement EDRi’s analysis and the previous Report prepared by three UN Special Rapporteurs on the proposal. In its Opinion, FRA structures its criticism around four main areas. First, it calls to improve the definition of “terrorist content”. The Opinion highlights the need to add to this definition the concept of “incitement” or giving specific instructions to commit terrorist offences. The definition of such instructions should be aligned with the Terrorism Directive and specific actions such as “providing specific instructions on how to prepare explosives or firearms”. Further, the text calls to limit the proposal to content disseminated to the public and to exclude from the Regulation’s scope certain forms of expression, such as content that relates to educational, journalistic, artistic or research purposes. Second, FRA calls to ensure that fundamental rights safeguards are in place through “effective judicial supervision”. Currently, there is no mention in the proposal of any “independent judicial authority in the adoption or prior to the execution of the removal order”. FRA also reminds of the need to avoid a disproportionate impact on the freedom to conduct a business when having to react to notices for removals of terrorist content in a very short time-frame (up to one hour in the original proposal). FRA suggests instead a reaction time of 24 hours from the receipt of the removal order. Regarding safeguards in cross-border removal orders, the Opinion calls to ensure that the authorities of the Member State where the content is hosted are “empowered to review the removal order in cases where there are reasonable grounds to believe that fundamental rights are impacted within its own jurisdiction.” FRA thus encourages the EU legislator to require a notification by the issuing Member State to the host Member State – in addition to the notification to the hosting service provider – when the removal order is issued. Third, FRA states that the proposal “does not sufficiently justify the necessity of introducing the mechanism of referrals”, and suggests to distinguish between content needing a removal order and content requiring a referral. Fourth, the Opinion states that the proposed proactive measures of the Regulation come very close to a general monitoring obligation. This is not only prohibited by Article 14 of the EU’s eCommerce Directive, but also generally incompatible with individuals’ right to freedom of expression under Article 11 of the Charter of Fundamental Rights in the European Union. Thus, FRA proposes to delete from the Regulation text the obligation for Hosting Service Providers’ (HSPs) to introduce proactive measures. While the EDPS issued similar concerns regarding the definition of terrorist content and the “one hour rule”, it also issued some targeted comments on the concerns surrounding potentially privacy intrusive elements of the Regulation proposal. In the Regulation proposal, Hosting Service Providers’ have obligations to retain data of supposed terrorist content that they delete or disable access to on their platform. The EDPS presents substantive doubts whether such obligations would be compliant with case law of the Court of Justice of the European Union (CJEU). This opinion was based on the assessment that the proposed measures, in similarity to the Data Retention Directive that was struck down by the CJEU in 2014, do not lay down specific criteria regarding the time period and access and use limitations for the retained data. The EDPS is further not convinced of the overall usefulness of data retention measures in the Terrorist Content Regulation, given that the text obliges HSPs to promptly inform the competent law enforcement authorities of any evidence regarding terrorist offences. On the proposal’s foreseen proactive measures, the EDPS stated that automated tools for recognising and removing content would likely fall under Article 22 of the General Data Protection Regulation (GDPR), which regulates citizens’ rights in automated decision making and profiling activities. This would, in turn, require more substantive safeguards than the ones provided in the Commission’s proposal, including case-specific information to the data subject, understandable information about how the decision was reached, and the right to obtain human intervention in any case. The observations of the EU’s most important fundamental rights institutions feed into a steady stream of criticism of the proposal. These represent noteworthy positions for policy makers in the legislator institutions, particularly in the European Parliament’s LIBE, CULT and IMCO committees that are currently adopting their positions. It is now more evident than ever that the proposed Terrorist Content Regulation needs substantive reform to live up to the Union’s values, and to safeguard the fundamental rights and freedoms of its citizens. At the Justice and Home Affairs (JHA) Council meeting on 6-7 December 2018, the state of play of the expert working group on data retention was discussed. Council document 14319/18 prepared for the meeting reveals that the common reflection process has produced no tangible results towards compliance with the Tele2 judgment: replacing general and indiscriminate (blanket) data retention with targeted data retention. Member States appear to be happy with their current and illegal data retention regimes and do not want to make any changes. A recurring element in the Council document is the unwillingness of Member States to accept the Tele2 judgment, often disguised under a very selective reading of the judgment. The expert working group has considered the concept of “restricted data retention”, previously analysed in the EDRi-gram. The main novelty is that Member States are supposed to limit the data categories to be retained to what is strictly necessary. No limitation is foreseen with respect to the persons concerned, which means that data about the entire population is retained, as with the current data retention regimes. Therefore, restricted data retention cannot possibly comply with the Tele2 judgment. However, even the token gesture of limiting the data categories has no support among Member States. They claim that the data categories which are not necessary for law enforcement purposes are already excluded. Based on this premise, Member States even contend that “there is no general and indiscriminate retention of data as referred to in the Tele2 judgment”, which is rather remarkable since the CJEU has stated the exact opposite in the Tele2 judgment. The renewable retention warrant (RRW) proposal is another attempt by Member States to circumvent the Tele2 judgment. While the warrant only covers a single provider of electronic communications services for a fixed period of validity, all providers are expected to be covered by different warrants that are constantly renewed because the RRW would be rendered ineffective for law enforcement purposes if not all providers are covered. In practice, the RRW will be indistinguishable from the current blanket data retention regimes. With the exception of one Member State, which uses a similar system (undoubtedly the United Kingdom), there is no support for the RRW since the system would be too complex and inefficient and would require changes to national laws on criminal procedure. After two years of “reflection” on the Tele2 judgment, Member States and their expert working group have not come up with a single realistic alternative to the current blanket data retention regimes that the CJEU has ruled to be illegal under EU law. The Council document does not describe a single suggestion which would actually make the data retention scheme targeted and limit the persons concerned by the measure, even though this is expressly required by the CJEU in paragraph 110 of the Tele2 judgment. The second part of Council document 14319/18 deals with access to the retained data. According to the Tele2 judgment, access to the retained data must be limited to investigations involving serious crime and must be subject to review by a court or an independent administrative authority. As a general rule, only data of individuals suspected of being involved or implicated in a crime can be accessed. Once again, Member States are reluctant to accept the restrictions imposed by the CJEU. Since there is no EU law or CJEU guidance defining “serious crime”, this task is left to Member States. Some Member States have a very broad definition, even to the point of including crimes that cannot be regarded as serious because of their low maximum sentence, but are nonetheless claimed to be perceived as serious by the general public. It is also noted in the Council document that without access to retained data, criminal investigations in cybercrime cases would often “turn out to be futile because digital evidence would be unavailable”. However, when data retention of electronic communications metadata is a particularly serious interference with fundamental rights, as the CJEU has established (Tele2 paragraph 100), access to the retained data must be subject to strict rules and will not always be available for law enforcement authorities. Since more and more activities are related to the online environment, making a complete carve out for crimes committed online would deprive the privacy and data protection safeguards at the access level of almost any meaning. The Council document notes that the judicial review regimes of most Member States are in line with the prerequisites set out by the CJEU, through a prior review by a court/judge, an independent administrative authority or the prosecution office. However, by silently adding the prosecution office, which is not an independent judicial authority, to the list, Member States are rather misleadingly overstating their compliance with the Tele2 judgment regarding the requirement of independent review of access requests. Finally, Member States are very reluctant to limit the access to the retained data to persons that are suspects or accused persons, as required by the CJEU, except in special cases involving terrorism (paragraph 119 of the Tele2 judgment). The main reason for this is that “proceedings are commenced not against certain individuals, but against (at least in the beginning) unknown perpetrators.” This suggests that law enforcement authorities routinely use data retention to find possible suspects of a crime, for example through cell phone tower inquiries where information is obtained about all persons that are present in a certain area. Data-mining investigations like this affect a large number persons, some of whom may become suspects simply because of their presence in a certain area (location data). The Tele2 judgment only allows broad access to the retained data as an exception in particular cases involving terrorism, but Member States want to turn the exception into the general rule by only requiring a connection to criminal investigations when retained data is accessed. At the JHA Council meeting in December, ministers agreed to continue “the work at experts level to explore avenues to develop a concept of data retention within the EU.” However, this is precisely what the expert working group has been doing for the past two years, without delivering a single proposal for data retention that respects the requirements of the Tele2 judgment. However, Member States are fighting for their blanket data retention regimes at other levels than ignoring the Tele2 judgment. One possibility is that the future ePrivacy Regulation will present a more “favourable” environment for data retention than the current ePrivacy Directive – something that the Council is actively working on. This could give Member States a “fresh start” on data retention since the CJEU would have to assess the national data retention laws against the new ePrivacy Regulation, but still interpreted in light of the (unchanged) Charter of Fundamental Rights. There is also the risk that the CJEU could revise its stance on data retention in some of the new cases that are pending before the Court (C-623/17 from UK, C-520/18 from Belgium, and C-511/18 and C-512/18 from France). The first question in C-520/18 is very similar to the first question in the Tele2 case, that is whether Article 15(1) of the ePrivacy Directive, read in the light of the Charter of Fundamental Rights, precludes a general obligation to retain traffic data for providers of electronic communications services. Member States would undoubtedly see this as an opportunity to “retry” the Digital Rights Ireland and Tele2 cases before the CJEU. On 2 October 2018, the Court of Justice of the European Union (CJEU) delivered a new ruling in the “Ministerio Fiscal” case on access to data retained by electronic communications service providers under the scope the ePrivacy Directive. While investigating the robbery and theft of a mobile phone, the Spanish police asked an investigating magistrate to order various providers of electronic communications services to disclose the telephone numbers that had been activated during a twelve-day period with the International Mobile Equipment Identity (IMEI) code of the stolen mobile device, as well as the names and addresses of the subscribers for the SIM cards used for this activation. The request was denied by the magistrate on grounds that the criminal offence did not fulfill the requirements for serious offences in the Spanish Law 25/2007 on the retention of data relating to electronic communications and to public communication networks. 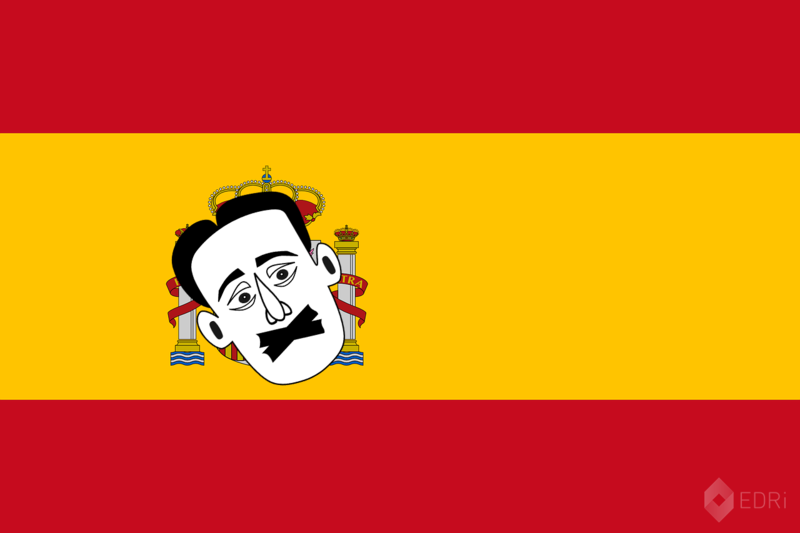 On appeal by the prosecutor, a Spanish court referred the case to the CJEU. The CJEU ruled that access to retained data for the purpose of determining the owners of the SIM cards used for activation of a mobile device entails an interference with the owners’ fundamental rights to privacy and personal data protection. However, the CJEU clarified that if the purpose for accessing the retained data is solely to obtain the subscriber identity, Article 15(1) of ePrivacy Directive allows restrictions of the rights provided for by the Directive for the prevention, investigation, detection, and prosecution of criminal offences – not just serious criminal offences. What is interesting about this ruling is that in its previous Tele2/Watson judgment, the CJEU had ruled that access to the retained data is limited to cases involving serious crime. To reconcile the two rulings, the CJEU explains that this is because the objective pursued by the access must be proportionate to the seriousness of the interference with the fundamental rights that the access entails. The Tele2 case is concerned with access to retained data which, taken as a whole, allows precise conclusions to be drawn regarding the private lives of the persons concerned. Such access constitutes a serious interference with fundamental rights and can be justified only by the objective of fighting serious crime. If, however, the access to retained data is a non-serious interference, as in the present case involving access to the subscriber’s identity, access can be justified by the objective of fighting criminal offences generally. The question that immediately comes to mind is whether this new case in any way departs from the strict conditions for access to retained data set forth in the Tele2/Watson judgment, and, in particular, whether the Ministerio Fiscal case waters down some of these conditions, thus allowing for access to retained data by law enforcement authorities in a greater number of scenarios. The object of the Tele2/Watson case is the retention of data which, taken as a whole, is liable to allow very precise conclusions to be drawn concerning the private lives of the persons whose data has been retained (first part of the judgment) and access to such data retained by electronic communications service providers (second part). In contrast, the Ministerio Fiscal case is concerned with the presumably very narrow situation where accessing data does not constitute a serious interference. This includes obtaining a subscriber identity. However, the CJEU confirms that access to retained data which reveals the date, time, duration and recipients of the communications, or the locations where the communications took place, must be regarded as a serious interference since that data allows precise conclusions to be drawn about the private lives of the persons concerned (cf. paragraph 60 of the ruling). In these situations, access to the retained data must be limited to cases involving serious crimes, as in the Tele2 case. There is, however, one scenario where the new judgment may add some confusion to the interpretation of the Tele2 judgment. According to paragraphs 108-111 of the Tele2 judgment, targeted data retention requirements for the purpose of fighting serious crime are compatible with EU law (unlike general and undifferentiated data retention which is illegal under EU law). Moreover, it would be natural to read paragraph 115 of the Tele2 judgment as always limiting the access to such retained data to cases involving serious crime because the targeted data retention requirement in itself constitutes a serious interference with fundamental rights that can only be justified by the objective of fighting serious crime. Allowing access to the retained data in cases not involving serious crime would arguably undermine the purpose limitation at the retention stage. The CJEU did not define what can constitute a serious crime. Similarly, the Ministerio Fiscal ruling does not clearly refer to why the data was retained in the first place or whether that should affect the conditions for access to the retained data. Because there is no apparent connection to why the data is retained, the CJEU now seems to say in paragraphs 54-61 of the Ministerio Fiscal ruling that if access is only sought to minor parts of the retained data, for example only for the purpose of obtaining the subscriber identity, accessing that data does not constitute a serious interference, even if the data is only available in the first place because of a (targeted) data retention order that can only be justified by the objective of fighting serious crime. This situation could arise in practice if the data retention order includes all data items in the (annulled) Data Retention Directive for a targeted group of persons, but access to the retained data is only requested for the purpose of determining the identity of a subscriber who has been assigned a specific dynamic IP address. The judgment clarifies that traffic data under the ePrivacy Directive includes the subscriber name and the IMEI address of the mobile device (cf. paragraphs 40-42). This implies that access to such data falls within the scope and safeguards of the ePrivacy Directive, and that the ePrivacy Directive cannot be circumvented by attempts to expand to definition of subscriber data. The judgment notes in paragraph 51 with reference to the Court’s Opinion on the EU-Canada Passenger Name Records (PNR) agreement that access to any retained data, including subscriber identity, constitutes an interference with the fundamental right to the protection of personal data. Therefore, the CJEU requires substantive and procedural conditions based on objective criteria for the access to the retained PNR data, and the access must be subject to prior review by a court or an independent administrative body. In the Ministerio Fiscal case, the CJEU was not asked to consider substantive and procedural conditions for access. Nonetheless, paragraph 51 of the judgment has potential implications for other parts of EU law, most notably the proposed e-Evidence Regulation, which allows for access to not just subscriber data, but also so-called access data (data necessary to identify the user of a service) for all criminal offences and without any requirements of prior review by a court (a prosecutor’s approval can be sufficient) or an independent administrative body. In paragraphs 34-37 of the Ministerio Fiscal judgment, the CJEU reiterates what it said in the Tele2/Watson judgment – that national legislation permitting access by competent authorities to personal data retained by electronic communications service providers cannot be regarded as activities of the state that fall outside the scope of Article 15(1) of the ePrivacy Regulation, since the access by competent authorities necessarily presupposes processing of personal data by the electronic communications service providers. 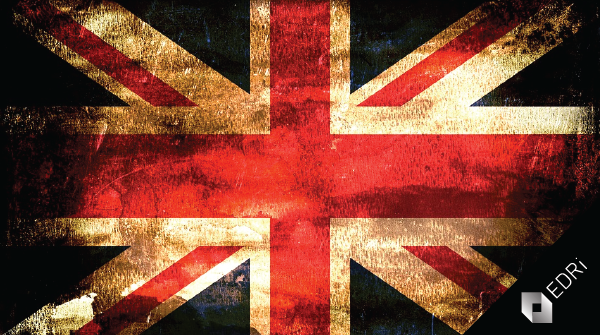 Freedom of expression campaigners, human rights groups and legal experts are raising concerns that proposed new counter-terrorism legislation in the United Kingdom would restrict freedom of expression and limit access to information online. The UK Parliament is currently considering the Counter-Terrorism and Border Security Bill, which could become law within a few months. The government aims to build on existing laws to fill gaps and close perceived loopholes. However, in doing so, the bill goes very far, including restricting online activity, which undermines fundamental rights to freedom of expression. For example, the bill would make it a crime to view online content that is likely to be useful for terrorism, even if you have no terrorist intent (and even if you are watching over someone else’s shoulder). The crime would carry a prison sentence of up to 15 years. It would make the work of investigative journalists and academic researchers difficult and risky – as mistakenly landing on an offending page could have major consequences. The first version of this clause required a person to access the wrong content three times, but the government has amended this to become a “one-click rule” rather than the original “three-click rule”. The bill would criminalise publishing (for example, posting on social media) a picture or video clip of clothes or a flag in a way that raises “reasonable suspicion” that the person doing it is a member or supporter of a terrorist organisation. Parliament’s Joint Committee on Human Rights recommended that this clause be withdrawn or amended because it “risks a huge swathe of publications being caught, including historical images and journalistic articles” and because of its potentially very wide reach and interference with Article 10 of the European Convention on Human Rights. The government has not taken this recommendation into account. United Nations special rapporteur Professor Fionnuala Ní Aoláin has expressed concerns that the proposed clause “runs the risk of criminalizing a broad range of legitimate behaviour, including reporting by journalists, civil society organizations or human rights activists as well as academic and other research activity”. She has expressed concerns about several parts of the bill and emphasised that it should be brought in line with the UK’s obligations under international human rights law. EDRi member Index on Censorship believes that the bill is not fit for purpose and should go back to the drawing board. It would significantly impact freedom of expression online, damage journalism and academic research, and signal the wrong direction for future online regulation in the UK. On 7 May 2018, the Eastern High Court in Denmark delivered a ruling that internet service providers (ISPs) are not required to disclose subscriber information in file sharing cases. This represents a major change of the previous legal practice in Denmark, where rightsholders were routinely granted access to subscriber information for alleged file sharers, even if the identification required access to retained data from mandatory data retention. Two Danish law firms have specialised in legal action against file sharers in cooperation with the German file sharing monitoring company MaverickEye UG, which is well known from similar activities in other European countries. MaverickEye monitors BitTorrent file sharing networks and collects IP addresses of the participants in the BitTorrent swarm. In order to verify that the copyrighted work is made available from the IP address in question, a small piece of the file is downloaded using a modified BitTorrent client. For each copyrighted work, MaverickEye provides information about IP addresses and timestamps to the relevant rightsholders or, in most cases, the specialised law firms that represents them. The next step is to seek a court order requiring the ISPs to identify the actual subscribers that have used the IP addresses at the specific time. This is the critical step and legal practice varies among EU Member States. If the subscriber names and addresses can be obtained from the ISPs, the law firm can either file a lawsuit demanding compensation for copyright infringement or send a letter to the subscriber with a proposed settlement for the case. The latter is generally the preferred option since lawsuits are expensive, and the alleged copyright infringement using BitTorrent is often limited to a single film or TV-series episode/season. In Denmark, the settlement offer from the law firm has typically been a payment of 200 to 300 euros for a single film. Only a handful of lawsuits have been filed with Danish courts, so most claims have either been settled or dropped if the subscriber denies having taken part in the alleged file sharing activity. Based on Danish case law for three file sharing cases at the two High Courts around 2008, the subscriber does not automatically become legally responsible for file sharing from the IP address. The rightsholder must prove who has committed the file sharing act in order to obtain compensation. This burden of proof can be very difficult to meet if the subscriber for instance has an open WiFi network, has allowed guests to use his/her internet connection, or if there are several persons in the household. Most subscribers are probably not aware of this, so it is quite likely that many cases have been settled by paying the offered settlement amount of 200 to 300 euros. The current wave of legal action started in 2014, and according to information from the recent High Court ruling of 7 May 2018, the two Danish law firms have obtained subscriber information for some 200,000 IP addresses. This shows the massive scale of the monitoring operation of file sharing networks by MaverickEye. Access to subscriber information for a large number of IP addresses has also been reported in Sweden by TorrentFreak, incidentally involving the same Danish law firm as the present case. Each court application for subscriber identification consists of a large number of IP addresses, for example 4000 IP addresses in the case ruled by the High Court on 7 May 2018. Because of the Danish data retention law, ISPs hold information about assignment of dynamic IP addresses for 12 months, so there is no urgent need for the law firm to quickly seek a court order for subscriber identification when information about the file sharing activity has been received from MaverickEye. A large batch of IP addresses from the same ISP can be collected before seeking the court order for subscriber identification from that ISP. Until recently, this assembly-line strategy by the two law firms to send letters to alleged file sharers did not meet any legal challenges. 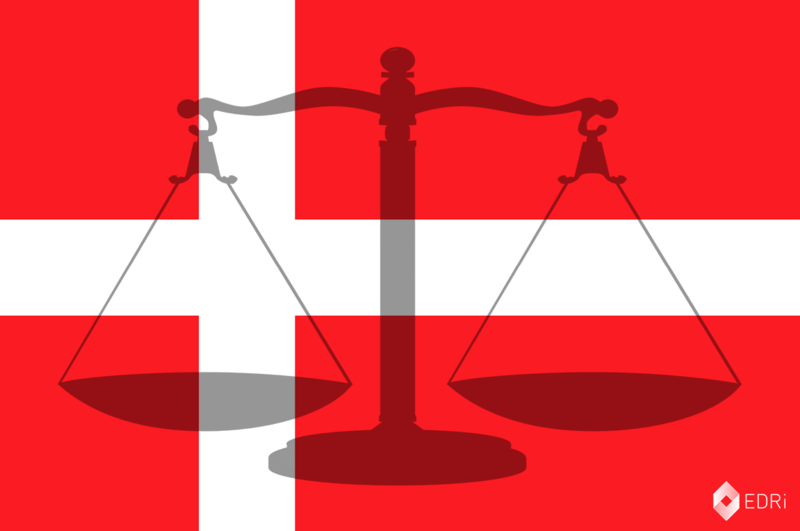 In most cases, Danish ISPs do not object to a court application for subscriber information, and there is no court hearing for the application. The sole purpose of the court order, which is granted without any objections, is to provide a legal basis for the ISP to disclose the personal data (subscriber information) to the rightsholder. However, between 2016 and 2017 the large Danish ISPs finally changed their response strategy and started to object to the court applications for subscriber information. Besides the administrative cost of handling the large number of requests for subscriber information and the increasing news media reporting of ISP customers complaining about file sharing allegations based on information obtained by law firms from their own ISP, the Tele2 data retention judgment (joined cases C-203/15 and C-698/15) of the Court of Justice of the European Union (CJEU) also played a major role. According to the Tele2 judgment, general and undifferentiated (blanket) data retention is illegal under EU law. Moreover, access to the retained data, whether from (illegal) blanket data retention or targeted data retention, must be limited to what is strictly necessary. For criminal offences, the Tele2 judgment specifically states that access can only be granted for serious crime. Paragraph 115 of the Tele2 does not completely rule out that access to the retained data can be granted for civil claims, as there is an indirect reference to the Promusicae case C-275/06. However, when access to the retained data for criminal offences is strictly limited to serious crime, it does not seem to be proportionate to grant access to the retained data in civil proceedings involving only a minor copyright infringement, such as file sharing of a single film or TV series. In a case involving Telenor and TeliaSonera, the District Court of Frederiksberg considered the data protection issues (noting that it was unclear whether this had been done in previous cases), but followed the established practice of ruling in favour of the rightsholder on 24 October 2017, that is ordering the disclosure of subscriber information. The ISPs appealed the court decision to the Eastern High Court. The ruling from the High Court on 7 May 2018, which reverses the ruling from the District Court and blocks disclosure of the subscriber information, is mainly based on an interpretation of the e-Privacy Directive 2002/58/EU and case law of the CJEU in Tele2, Promusicae and Bonnier C-461/10. The e-Privacy Directive imposes an obligation of confidentiality on ISPs with respect the subscribers’ use of the internet. ISPs must delete traffic data, such as assignment of dynamic IP addresses, when it is no longer needed for the purpose of the transmission of a communication. According to statements to the High Court given by Telenor, TeliaSonera and a third ISP not involved in the case (TDC), information about assignment of dynamic IP addresses to individual subscribers is retained for at most 3-4 weeks for operational purposes. Therefore, the necessary information is only available in a special system for law enforcement access because of the Danish data retention law which has a mandatory 12-month retention period. The High Court then considers the case law of Promusicae and Bonnier, and notes that the e-Privacy Directive does not preclude national legislation which requires disclosure of subscriber information in civil proceedings on copyright infringement, but that it must be possible to consider the opposing interests in an application for disclosure. In the present case, the High Court finds that there are compelling reasons against disclosure. The information needed to identify the subscribers is only available because of the data retention obligation, and the sole purpose of the data retention provisions is to enable the police to obtain access to retained data for the purpose of investigation and prosecution of criminal offences. The Court is aware that the civil claims cannot be pursued without access to subscriber information, and that it is likely that there has been a substantial copyright infringement. After balancing the opposing interests, the Court finds that this does not outweigh the confidentiality of communication for the subscribers under the e-Privacy Directive. Therefore, the request for disclosure of subscriber information is denied. The decisive factor in the High Court ruling is the Danish data retention law which limits access to the retained data for the purpose of investigation and prosecution of criminal offences. 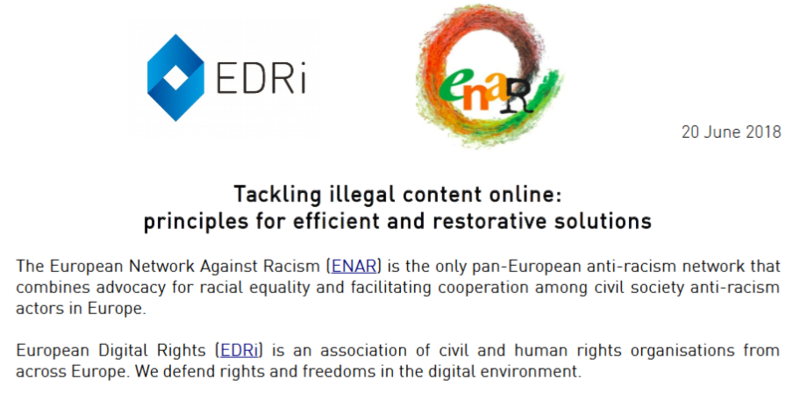 The European Network Against Racism (ENAR) and European Digital Rights (EDRi) joined forces to draw up some core principles in the fight against illegal content online. Our position paper springs both from the perspective of victims of racism and that of free speech and privacy protection. The European Commission has so far not been successful in tackling illegal content in a way that provides a redress mechanism for victims. In fact, the European Commission has been way too long focused on a “public relations regime” on how quickly and how many online posts have been deleted, while not having a diligent approach for addressing the deeper problems behind the removed content. Indeed, the European Commission has been continuously promoting rather superficial “solutions” that are not dealing with the problems faced by victims of illegal activity in a meaningful way. At the same time, the European Commission’s approach is undermining people’s rights to privacy and freedom of expression by urging and pressuring internet giants to take over privatised law enforcement functions. As a consequence, ENAR and EDRi have agreed a joint position paper following our commitment to ensure fundamental rights for all. 1. No place for arbitrary restrictions – Any measure that is implemented must be predictable and subject to real accountability. 2. Diligent review processes – Any measure must be implemented on the basis of neutral assessment, rather than being left entirely to private parties, particularly as they may have significant conflicts of interest. 3. Learning lessons – Any measure implemented must be subject to thorough evidence-gathering and review processes. 4. Different solutions for different problems – No superficial measure in relation to incitement to violence or hatred should be implemented without clear obligations on all relevant stakeholders to play their role in dealing with the content in a comprehensive manner. Illegal racist content inciting to violence or discrimination should be referred to competent and properly resourced law enforcement authorities for adequate sanctions if they meet the criminal threshold. States must also ensure that laws on racism and incitement to violence are based on solid evidence and respect international human rights law. This paper follows cooperation between the two organisations over the past few years to bring the digital rights community and the anti-racist movement together in a more comprehensive way. The common initiative comes at a time where the European Commission is consulting stakeholders and individuals to provide their opinion on how to tackle illegal content online by 25 June 2018. EDRi has developed an answering guide for individuals that consider that the European Union should take a diligent, long-term approach that protects for the victims of illegal content, such as racism online, and victims of free speech restrictions. EU Member States are still working to adopt their position on the ePrivacy Regulation proposed by the European Commission in January 2017. A number of draft compromise texts have been published by the Council Presidency before discussions in the Working Party on Telecommunications and Information Society (WP TELE). Unfortunately, the Council transparency in publishing those documents does not extend to the part of the ePrivacy Regulation that concerns data retention. This means mainly Article 11, which allows Member States to restrict the rights to data protection and confidentiality of electronic communication under certain conditions, in a similar way to Article 15(1) of the current ePrivacy Directive. This part of the ePrivacy Regulation is being discussed jointly by WP TELE and the Working Party on Information Exchange and Data Protection – Friends of the Presidency on Data Retention (DAPIX FoP), which is also tasked with analysing the implications of the Tele2 judgment (joined cases C-203/15 and C-698/15) from the Court of Justice of the European Union (CJEU). Documents from these discussions are marked “LIMITE” and therefore not generally available to the public. An incomplete picture of the work is available through a combination of Freedom of Information (FOI) requests and leaked documents. It is known that DAPIX FoP has developed the concept of ”restricted data retention” which is a deliberately crafted attempt to circumvent the Tele2 ruling of the highest court of the European Union (the CJEU) with a data retention scheme that is, in reality, general and undifferentiated (and therefore illegal) while officially claiming not to be. Recently, the working document WK 11127/2017 of 10 October 2017 was released in full through a FOI request by Corporate Europe Observatory. This document provides another piece of the puzzle regarding the secret data retention discussions in Council working groups by outlining two different strategies for storage of electronic communications metadata for law enforcement purposes. The first strategy is based on data retained by providers of Electronic Communication Services (ECS) for business purposes. Article 6(2)(b) of the Commission proposal for the ePrivacy Regulation allows ECS providers to process electronic communications metadata for purposes of billing, calculating interconnection payments as well as stopping fraudulent or abusive use of ECS. The working document proposes to expand Article 6(2)(b) to include ”illicit use” of ECS, which would allow processing for a broader purpose than abuse or fraudulent use of the communications service itself. Potentially, ”illicit use” could include any crime or illegal behaviour committed by the subscriber with the assistance of the electronic communications service, even if the ECS provider is not the victim of the offence (such as through fraudulent use of the service). The working document further proposes a minimum six month retention period for electronic communications data processed under the broadened purposes of Article 6(2)(b). In effect, this is mandatory blanket data retention disguised as storage of communications data processed for voluntary business purposes, like billing. When ECS providers process communications data for business purposes, the processing, and in particular any storage of personal data, should be limited to the duration necessary for this purpose. Setting a minimum mandatory retention period for communications data processed under Article 6(2)(b) will mean weakening the level of protection guaranteed under the General Data Protection Regulation (GDPR), which is not only unacceptable but also contradictory to the ePrivacy Regulation being lex specialis to the GDPR. If Member States want to “ensure” the availability of electronic communications data for law enforcement, this should be done by appropriately restricting the rights to data protection and confidentiality of communications in accordance with Article 11 of the ePrivacy Regulation and, in particular, in accordance with the CJEU case law which prescribes targeted data retention rather than blanket data retention. The second consideration in working document WK 11127/2017 is to exclude processing for law enforcement purposes from the scope of the ePrivacy Regulation in Article 2(2). Under the current ePrivacy Directive, both the retention of electronic communications data and access to retained data by competent authorities is within the scope of the Directive. The working document suggests that excluding processing for law enforcement purposes from the scope of the ePrivacy Regulation could ”bring more clarity to the legal context of data retention”. This would put national legislation for mandatory data retention outside the scope of the ePrivacy Regulation and possibly even outside the scope of EU law, which would be very dangerous for fundamental rights. It could also be considered that it does not put this activity outside the scope of EU law (or at least not fully), as data retention could be considered an exception to the GDPR. So much for “clarity”. The current ePrivacy Directive provides legal clarity for the retention of electronic communications data and access to the retained data since both types of processing are covered by Article 15(1) of the Directive. Furthermore, CJEU case law provides specific conditions for retention and access to electronic communications data, which ensure appropriate safeguards for fundamental rights. Excluding processing for law enforcement purposes from the scope of the ePrivacy Regulation would bring less legal clarity, not more. In addition, a Regulation aimed at protecting personal data and confidentiality of electronic communications would be deprived of its purpose if certain types of processing (such as “processing for law enforcement purposes”) are completely excluded from its scope. This was also noted by the CJEU in paragraph 73 of the Tele2 judgment. On 25 April 2018, EDRi member Statewatch published a recent document from the Bulgarian Council Presidency on data retention. Working document WK 3974/2018 looks at the “renewable retention warrant” (RRW). The intention is that competent authorities can issue data retention orders (warrants) to ECS providers under certain conditions. The legal basis for issuing RRWs will have to be national law as no EU legal basis currently exists. It is suggested by the Presidency that ECS providers could appeal the warrant, which would give private companies the job of safeguarding citizens’ fundamental rights. Even though the data retention requirements for RRWs could differ among ECS providers, the Presidency notes that the RRW would be rendered ineffective for law enforcement purposes if not all providers are covered. This will make the RRW approach identical to blanket data retention for all practical purposes and, therefore, a clear circumvention of CJEU rulings. The patchwork of Council documents (only some of which are available) from DAPIX FoP on data retention shows that some Member States governments are exploring every possible option to uphold their current data retention requirements, despite two very clear CJEU rulings in 2014 and 2016 that blanket data retention is illegal under EU law. These efforts often take place behind closed doors in Council working groups, and the discussions only receive input from Member States’ governments and EU institutions in the law enforcement area, such as Europol and the EU Counter-Terrorism Coordinator. The European public, civil society organisations and data protection authorities are excluded from most of the critical discussions around data retention. In the past, this approach has repeatedly produced legislation such as the Data Retention Directive which was later overturned by the CJEU. After working document WK 11127/2017 was published in full, European Digital Rights and EDRi members Access Now, Privacy International and IT-Pol Denmark, sent an open letter to EU Member States on the ePrivacy reform. The letter calls upon EU Member States to ensure privacy and reject data retention.